Don't we all love smooth lips? As I love to scrub my body and face and lip scrub is a must! Especially when you are a lipstick wearer, you just want to get rid of all the dead flaky skin off your lips. 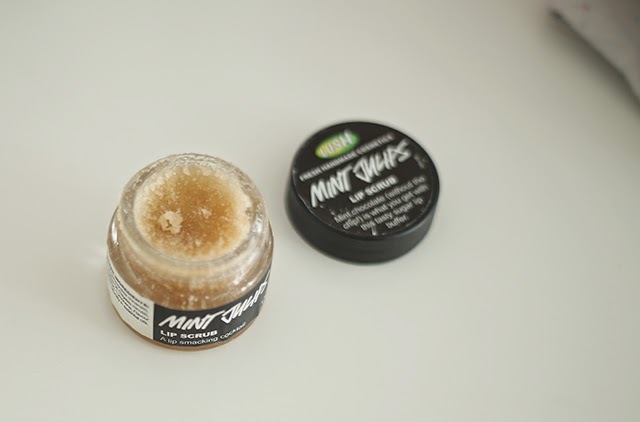 Lush have few different scented/taste lips scrubs, I personally prefer minty scent, as I like the tingly coolness it leaves on the lips. The scrub is made out of real sugar crystals, after you finish the scrub you can just lick it off your lips. Yeah, it's very sweet in taste. It contains Organic Jojoba Oil, Peppermint Oil, Tagetes Oil, the oils leave your lips moisturised. The little pot goes a long way. The scrub can be a little messy when you apply too much on your lips, as then the bits will fall on your top. I personally just love taking care of my lips, as I love when a lipstick looks good. If you have any recommendation of lip care products, please feel free to let me know. I am still loving my Nuxe Lip Balm.